This page includes The Club News columns from the 1997 issues of Across the Fence Post. Milwaukee-area clubs held their 11th annual Distinguished Philatelist Appreciation Dinner on March 16, 1997. This year's honorees were Gene and MaryAnn Bowman. They were selected for the honor because they have visibly and repeatedly demonstrated their interest in the hobby of stamp collecting. Both are members of the Waukesha County Philatelic Society. Gene's exhibit of Cape of Good Hope triangular stamps has won many international-level awards. MaryAnn has served for over 10 years as the WFSC's VP Youth Division and is active in youth philately in numerous areas on the national level. The 1997 event was hosted by the Italian-American Stamp Club, with Bill Otto serving as chairman of the Advisory Committee. Due to a double booking by the hall management, dates for the 1997 TRI-PEX Stamp Fair have been changed to June 28-29. The event will be held at St. Aloysius Gonzaga Hall, 1435 So. 92nd St., West Allis, WI. Hours are 10 a. in. to 5 p. m. on Saturday: 10 a. m. to 4 p.m. on Sunday. After a six-year hiatus. FONDYPEX returns as a one-day show this fall. The event is sponsored by the Fond du Lac Stamp Club and will be held on Saturday, September 13 at the American Legion Memorial Clubhouse in Fond du Lac, WI. Show hours are 10 a.m. to 5 p.m. For further details, contact: Fred Ericksen, P.O. Box 821, Fond du Lac, WI 54936-0821. The Badger Stamp Club's annual DANEPEX returns on Saturday, November 1, after a one-year break to search for a new location. The show will be held from 9 a.m. to 5 p.m. on Madison's far-east side at Abundant Life Christian Church School, 4901 E. Buckeye Road. Features are a 16- to l8-dealer bourse, U.S. Postal Service Substation, competitive exhibits, and a youth activities area. A display related to the show theme of postal "firsts" will include Madison's earliest known cover postmarked October 22, 1837. For further information, contact: Karen Weigt, 4184 Rose Ct., Middleton, WI 53562-4339, (608) 836-1509. STAMP SHOW '97, sponsored by the Kenosha Stamp and Cover Club, was held February 15-16 at St. Mark's Auditorium in Kenosha. Show covers, which depict the first two United States stamps, are still available. For mail-order information, contact: KSCC, P.O. Box 1524, Kenosha, W1 53141-1541. Circus World Museum Promoter Chappie Fox is featured on the multicolored cachet of the Milwaukee Philatelic Society's 1997 circus parade cover. Covers were canceled each day of the parade celebration held July 10-13 at the lakefront Veterans Park showgrounds. The MPS has issued circus parade covers for each year 1971-73 and 1985-97. Cost of the 1997 cover is $1 each or $5 for a set of four. Send orders to: MPS Circus Covers, P.O. Box 1980, Milwaukee, WI 53201. Make checks payable to MPS and include a #10 SASE. 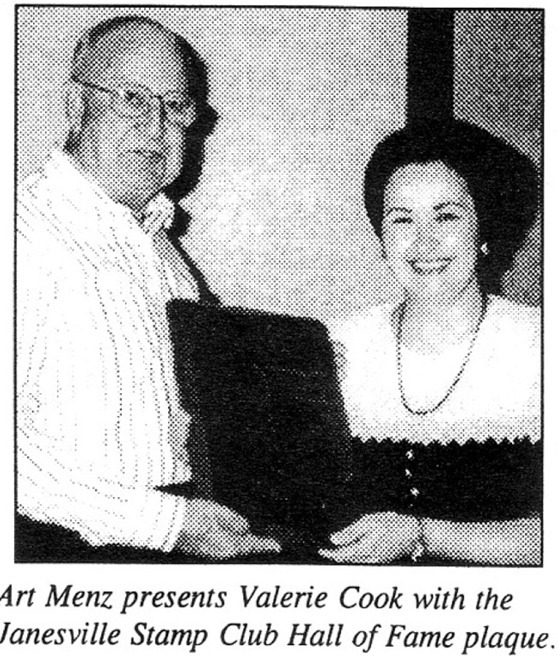 In June, Valerie Cook became the newest member of the Janesville Stamp Club's Hall of Fame. Cook will retain the plaque, to which her name has been inscribed, until the next inductee is honored. The club's Hall of Fame was instituted in 1996. Honorees are chosen because of their outstanding service to the club and efforts in promoting philately. The plaque holds space for a total of 12 names. In order to be more descriptive to the general public, the Wisconsin Valley Philatelic Society has substituted the word "fairs" for their usual fall/winter "bourses." Dates for the 1997 fairs are November 8 and December 6. 1998 dates are January 10, February 14, March 14, and April 11. The fairs are held from 10 a.m. to 4 p.m. at Days Inn (formerly Rib Mountain Travel Inn) in Wausau. The event was held September 27-28 at the VFW Hall in Wausau, WI. It was dedicated to the memory of Wilmer (Bill) Kendall, with two exhibit frames showing items depicting Bill's philatelic life in the Wausau community. 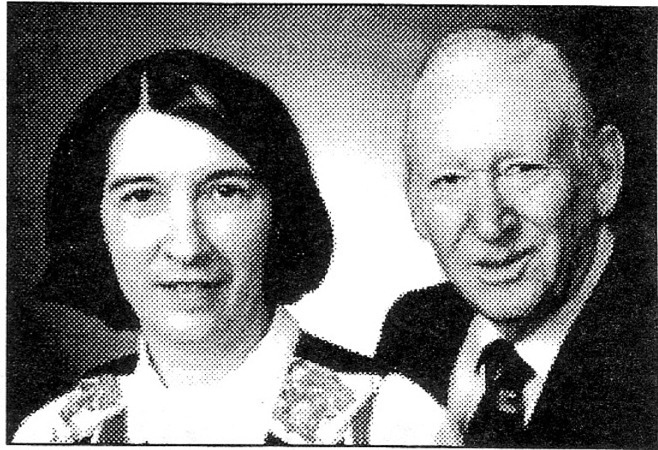 Kendall, a longtime WVPS member and stamp dealer passed away on July 29, 1997. The Northwoods Philatelic Society (Iron Mountain, MI) cordially invites visitors to its meetings held every third Tuesday of the month at First Lutheran Church, 1210 So. Stephenson Ave., Iron Mountain, MI. Meeting time is 7 p.m.